Happy couples love reminders of their good times together all around the home. They now can add the cutest Valentines Day photo frame to their collection. Take a look at this Motorcycle Couple LED Photo Frame from Precious Moments to hold one of the many cherished moments that shows your love for one another. This “You’re My Road To Happiness” Billboard Photo Frame is really adorable. 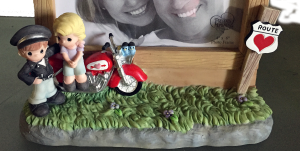 It has the cutest figurine of a motorcycle couple on one side and lets your photo stand out in a billboard style. This certainly makes it easy for your photograph to stand out. The LED lights on the top of the frame certainly help make the photograph just pops. This would certainly be such a great addition to the family room or the bedroom. You can use the LED lights to make the picture shine and highlight the moment that photograph captured. Don’t worry! The cell batteries that these lights need come together with your picture frame. So you can set it up ahead of time and surprise them with it. The cute figurines and scene around the photo frame are hand painted meticulously and is made of cold-cast resin. It is just so simple and cute that you can not avoid smiling every time you look at it. This Valentine day photo frame definitely makes for a good couples gift for both of them to enjoy together. It would be a cute anniversary gift, so they could celebrate their years of love together. If you have a picture of the happy couple, add that in! I am sure the would love to know that everyone adores them as a couple and are there to wish them well and have many more happy years together. It definitely makes a great Valentine’s Day gift for her to find extremely cute and adorable! Watch her “aww” in surprise over this gorgeous frame. Make it extra special by actually adding a 4″ by 6″ image that reminds her of a significant moment in your journey together. 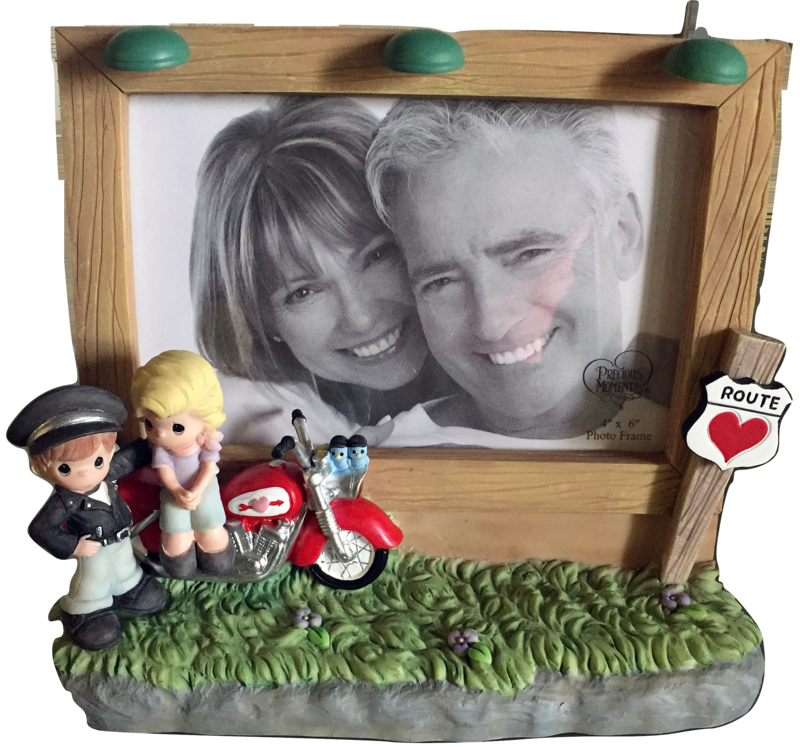 She would love the fact that the photo frame is so cute with super adorable figurines of a boy and a girl in retro style. I also think that couples would enjoy the extra charm that motorcycle adds to the frame. The motorcycle sort of adds a sense of adventure to it. It could signify the adventurous journey the couple is having in this relationship. Whether they have been dating or are married, their relationship certainly would have been a fun ride on Route Love (see that sign on the frame?). This frame can help them remember that as they walk around the home and see this cute piece of memory. Life has its ups and downs. There are moments filled with happiness and others filled with frustration. No relationship is filled with roses and smiles all the time. Some are surely filled with sadness, anger, and so much negativity. It is these small reminders around the house that will remind you that this bad time too shall pass. It might just be a cute picture frame but that could be all it takes to get you smiling and remembering the good times again. Rough times needs that one moment where we can say ” this too shall pass”. It will help us remember that things will get better and that all is well. Now this Motorcycle Couple LED photo frame can help you do that. It can help you smile when you feel down. And that acts as a power boost that keeps a relationship going. 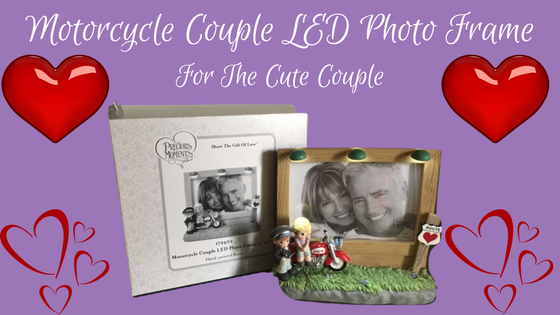 Personally, I think this motorcycle couple LED photo frame is the cutest present for the couple to enjoy. It makes for a great Valentines Day photo frame and definitely an awesome couple picture frame. It would be a perfect gift for your partner’s birthday, your anniversary, and Valentine’s Day. Don’t you think that this photo frame is certainly the cutest and the perfect gift? I sure hope that you enjoyed learning about the cutest and most adorable Valentines Day photo frame. 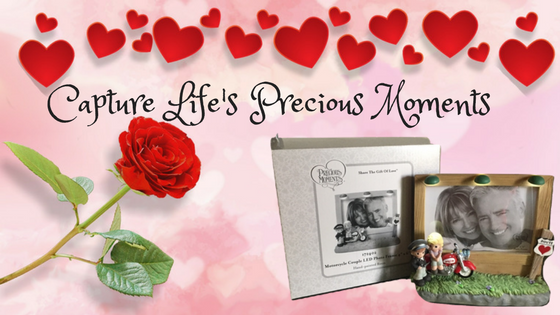 Take a look at a few more adorable couples gift from Precious Moments. Disclaimer: I did receive a free Motorcycle Couple LED Photo Frame for the purpose of posting an objective review on this site. I was only required to post my honest opinion and that is what you would find in the article above. I thank Precious Moments for this great product review opportunity.